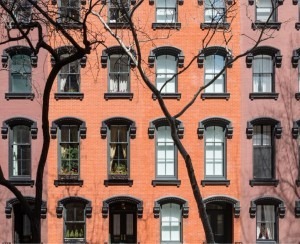 Though rents have stabilized and even decreased in certain neighborhoods during the past year, overall prices are still exorbitant for many people. 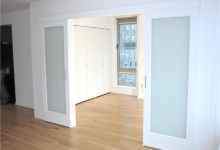 One solution is to use temporary walls to subdivide apartments to increase their affordability. 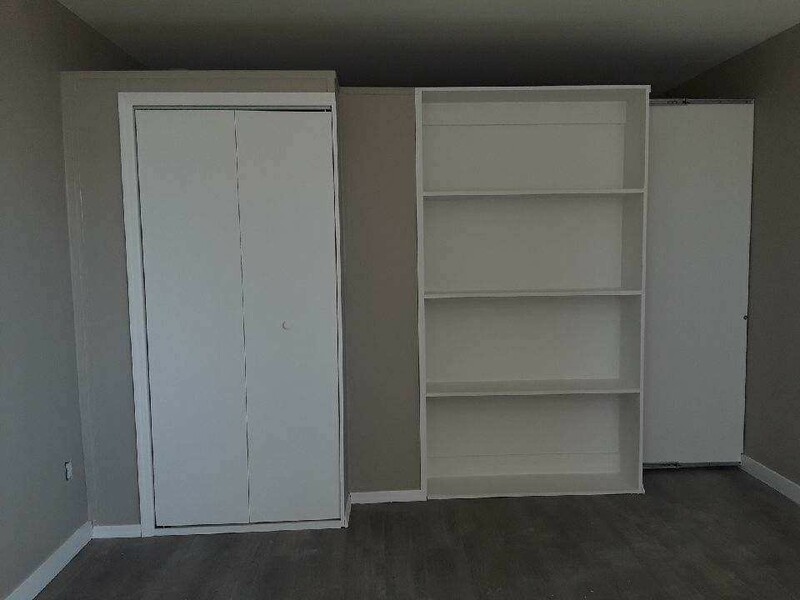 With fewer landlords permitting full-sized pressurized walls, renters have been turning to bookcase dividers, which do not reach the ceiling—they typically end about a foot below—and are considered movable furniture. That said, while many management companies contacted by Brick Underground confirmed that they allow bookshelf walls, some had stipulations, such as that the wall can't be affixed to the floor. Other management companies told us they allow them in certain buildings on a case-by-case basis. Still others don't allow any walls to be added, regardless of the type, for "fire safety reasons" or potential subletting issues. Since management companies are so cautious about any type of temporary wall, we suggest you check with your particular management company (and review this list of landlords that allow temporary walls) before you sign a lease (if you know you'll want a partition) or before you construct a wall in your apartment. Bookshelf walls, which range in price from around $900 to $1,950 installed, are gaining popularity. 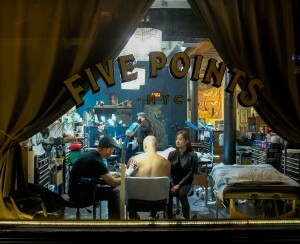 A decade ago, for instance, bookshelf walls represented only about 2 percent of temporary wall installer Wall 2 Wall NY's business, the company's owner told Brick Underground. Nowadays, these not-quite-ceiling-height walls represent at least 50 percent of business. “Buildings aren’t allowing walls to go to the ceiling, and aren’t even allowing doors, or if so, they can’t be attached, and we want to stay code compliant. 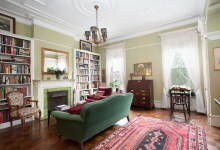 Even for properties offering bookcases, nothing can go to the ceiling, and nothing wall to wall,” says Wall 2 Wall’s owner. 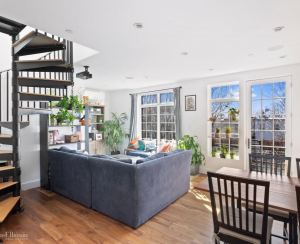 Dr-WALL, founded in 2007, installed only pressurized walls until 2010, but with the shift away from those, the company’s ratio of bookshelves to walls in Manhattan, Downtown Brooklyn, and Long Island City is now 85 percent bookcases versus 15 percent pressurized walls, says owner Ran Refaeli. Wall 2 Wall NY says its standard bookcase is the most popular model, since at $925, it’s the most economical option. The second most popular is the shelf with one closet, with a price tag of $1,350. For more helpful hints about bookshelf and other temporary walls, check out our Insider’s Guide to Temporary Walls. Wall 2 Wall NY’s bookcase wall with a French door and a plexiglass transom is a custom job that allows for both privacy and light. Cost: $1,850. For those interested in shelving that comes in a variety of sizes, this bookcase wall from Dr-WALL could be a good option. It has 12-inch-deep shelves, a small section with a hanging rod, and a sliding door. Cost: $1,050. 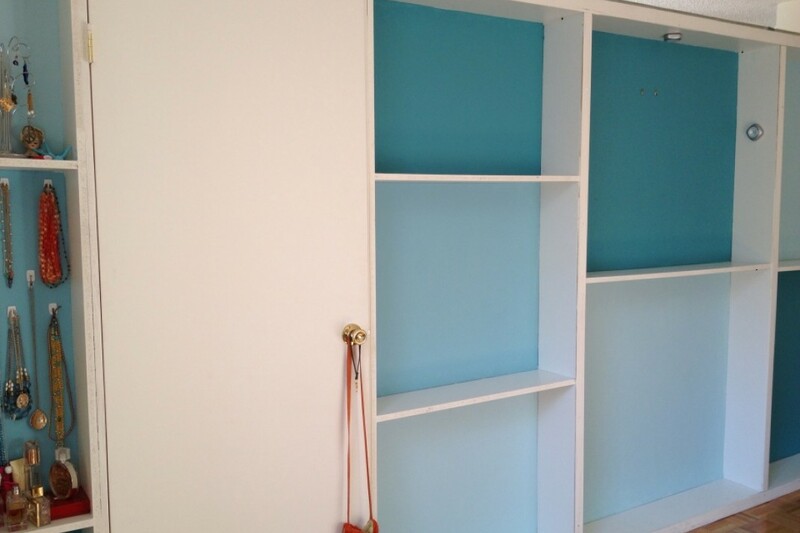 This bookcase wall/closet combo from Wall 2 Wall NY is a popular standard offering. Cost: $1,500. This six-inch thick bookcase wall from Room Dividers NY features two sets of shelves and a sliding door. Cost: $950. Another variation from Room Dividers NY features shelves on either side of a center door, offering a balanced look that may feel more like a real wall (in spite of the fact that it doesn’t reach the ceiling). Cost: $950. 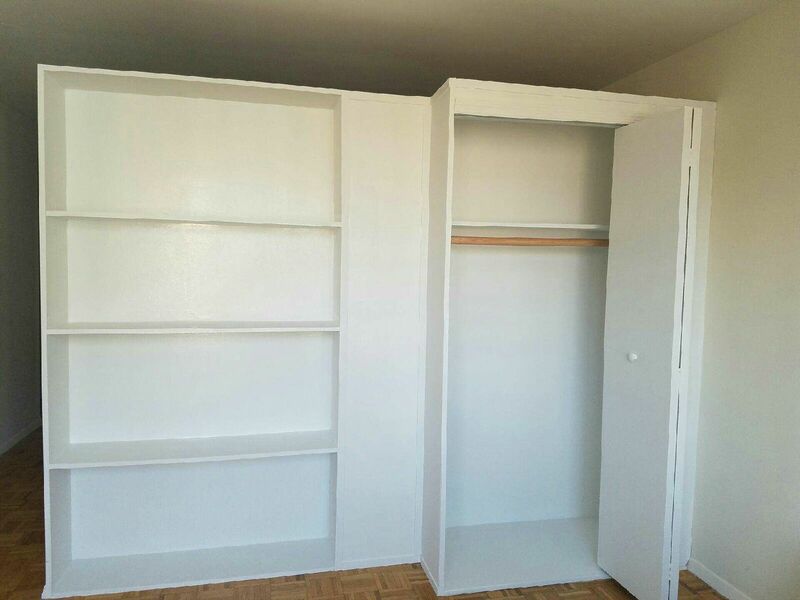 This wall from Wall 2 Wall NY sports two sections of shelves with a pocket door and can be customized to the required distance from the ceiling. Cost: $1,250. 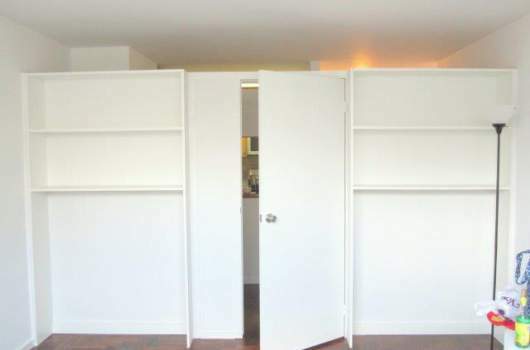 This bookcase/closet combo from Wall 2 Wall NY uses a sliding door, which does not have a frame, unlike pocket doors. The door attaches to the bookcase and the wall is completely freestanding, says Wall 2 Wall NY. Cost with just the bookcase: $1,175. 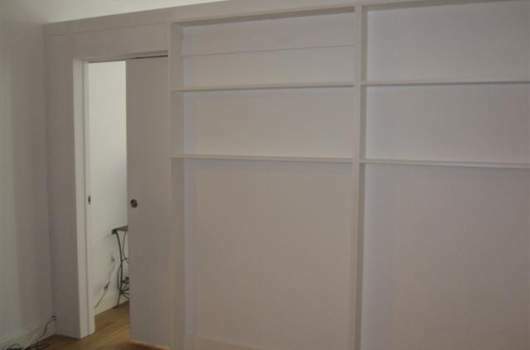 Cost with the bookcase and the closet: $1,495. 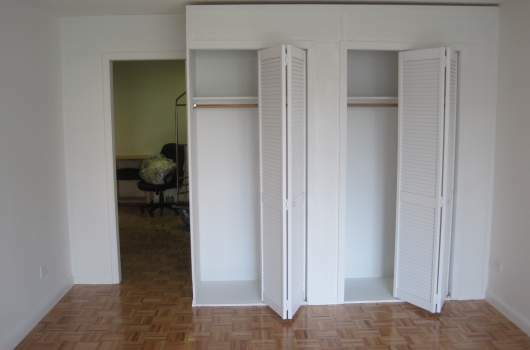 If it’s storage space you’re looking for as an added bonus to partitioning rooms, Wall 2 Wall NY offers a double closet option as well, which can be customized to stop the appropriate distance from the ceiling. Cost: $1,950.